President Donald Trump came out in defense of his eldest son Donald Trump Jr. on Tuesday, after he release of the email chain that set up a meeting with a Russian lawyer promising incriminating information on presidential candidate Hillary Clinton. “My son is a high-quality person and I applaud his transparency,” Trump said in a brief statement read to reporters by White House spokeswoman Sarah Sanders. 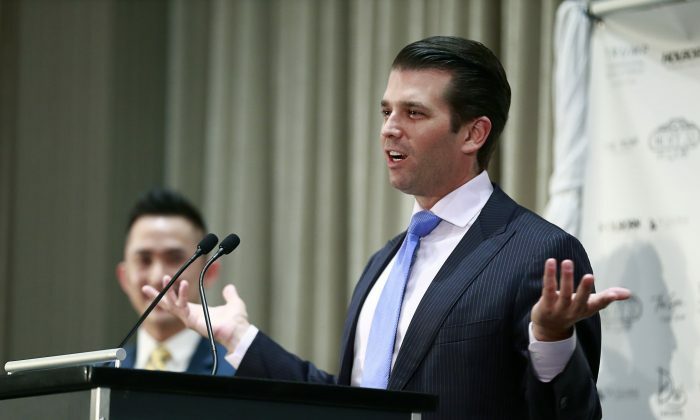 The meeting, set up by former journalist Rob Goldstone, put Trump Jr. in a room with Natalia Veselnitskaya, a Russian lawyer who has since denied any connection with the Russian government. Also at the meeting were President Trump’s son-in-law, Jared Kushner, and then-campaign chairman Paul Manafort. Trump Jr. said that he agreed to meet the lawyer after Veselnitskaya promised damaging information about Democratic candidate Hillary Clinton. But after offering “vague, ambiguous” statements that “made no sense,” Trump Jr. said Veselnitskaya’s true motives became clear. “It quickly became clear that she had no meaningful information. She then changed subjects and began discussing the adoption of Russian children and mentioned the Magnitsky Act. It became clear to me that this was the true agenda all along and that the claims of potentially helpful information were a pretext for the meeting,” he wrote in a statement released on Twitter. The Magnitsky Act is a law passed by Congress in 2012 to punish Russians suspected of human rights abuses. Veselnitskaya has clients who have been impacted by the act, including Russian state-owned companies. Sergei Magnitsky was a Russian lawyer and auditor who died in a Moscow prison in 2009. Veselnitskaya has also supported a film aimed at discrediting Russian account Magnitsky and has been a vocal critic of the act. According to the Financial Times, she flew to New York last year to represent Denis Katsyv, a Russian client and family friend who owns the investment firm Prevezon Holdings. That firm is allegedly helped launder money linked to the $230 million tax fraud exposed by Magnitsky, The New York Times reported. Veselnitskaya is also reportedly the founder of the Human Rights Accountability Global Initiative Foundation, a group aiming to restore American adoption of Russian children.